Near the end of April and beginning of May, halfway between the Spring Equinox and the Summer Solstice, you will find the Sabbat of Beltane. The Earth has awoken and is bringing forth new life and new growth to abound. Depending on your tradition, there are a number of ways you can celebrate this Sabbat: Balefires, Crafting, Ceremonies, Cooking and Spring cleaning, to name a select few. 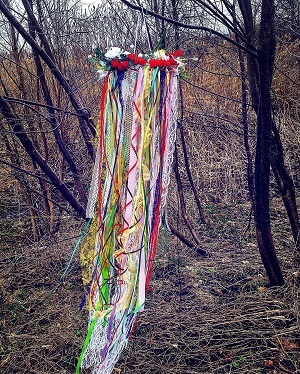 It is not always possible to create a Maypole in your yard or have a celebration of its kind in the city, however, you can make something on a smaller scale to draw abundance and new beginnings to you. We have been recently asked what other ways can one take part in this day. Last week we spoke of the Power of Art, we will continue with the theme and provide you with the tools to create a Beltane Wind Chime for this special day. Whatever you do decide this Beltane, be sure to spread the joy throughout the land.